Knowing your rights is the first step in being the best advocate for yourself! The following information provides an overview of important federal and state laws that ensure equal opportunity for people with disabilities. As an advocacy organization, the National Federation of the Blind and the National Federation of the Blind of Maryland, played a leading role in the passage of these laws. To find out more about how these laws may apply to you, contact the agencies and organizations listed. The major state law that protects people from discrimination based on blindness is the Maryland White Cane law prohibiting discrimination in employment, housing, and in public accommodations, and ensuring access to public facilities, streets, sidewalks, and other public places in the State of Maryland. The law includes special provisions for blind and visually impaired pedestrians as it instructs drivers to be observant of blind and visually impaired pedestrians using a white cane or guide dog to navigate public transportation. The law also guarantees a blind person the right to be accompanied by a specially trained dog guide in all public accommodations and on all forms of public transportation. read the Maryland White Cane law in MS Word format. If you feel your rights have been denied under The White Cane Law, contact the Maryland Commission on Civil Rights or the Human Relations Commission for the county in which you live. If the human relations commission finds that discrimination occurred and the employer refuses to settle, the complainant may go to state or federal court for a remedy. Having a state court remedy was added to Maryland law in 2007. HB 18/SB 2 is the state law, enacted in 2001, that prohibits discrimination in the workplace on the basis of genetic information. This law is important because some causes of blindness are genetic. Read the genetics discrimination law in MS Word format. Read the genetics discrimination law in PDF format. The Individuals with Disabilities Education Improvement Act (IDEA) is the federal law that guarantees blind and visually impaired students the right to a free and appropriate public education. The law specifies that each student must have an individualized education plan (IEP) and outlines the parents’ rights to be involved in the development of the IEP. For additional information on IDEA, visit the new IDEA web site and the Wrights Law web site. For additional information on how IDEA is being implemented in the State of Maryland, visit the Maryland State Department of Education web site. For additional resources visit the Maryland Disability Law Center web site. The Maryland Literacy Rights and Education Act, enacted in 1992, guarantees the right to instruction in Braille reading and writing for blind and visually impaired students. Students must have the opportunity to learn Braille even if they have partial vision. It will be appropriate for some visually impaired students to learn to read both Braille and print. When determining if a student should learn Braille the IEP team must consider the students future literacy needs and whether the student has a medically indicated expectation of visual deterioration. Read the Maryland Literacy Rights and Education Act in MS Word format. For further reading on the Braille literacy issue, see the NFB's article "Braille, Print, or Both?". The State of Maryland has enacted several laws that provide non-visual access to instructional technology. In 2002, SB 226 was enacted into law. This legislation insures equivalent access for students with disabilities to the Technology for Education Program. This program is for students in elementary and secondary schools. Read SB 226 in MS Word format or PDF format. SB 360 was enacted into law in 2005. This law requires all public institutions of higher education in Maryland to adopt non-visual access standards to online learning and the procurement of information technology by January 2007. Read SB 360 in MS Word format or PDF format. In 2012, SB 674, concerning instructional technologies, was enacted into law. This legislation enhances the accessibility requirement that was established under the 2002 law by mandating the use of the same standards that measure accessibility under subsection (A)(2) of Section 508 of the federal Rehabilitation Act of 1973. Read SB 674 in Word Format or PDF format. In 2013, nonvisual access to instructional technologies and online learning for blind students in grades K-12 was also strengthened by the enactment of SB 461. 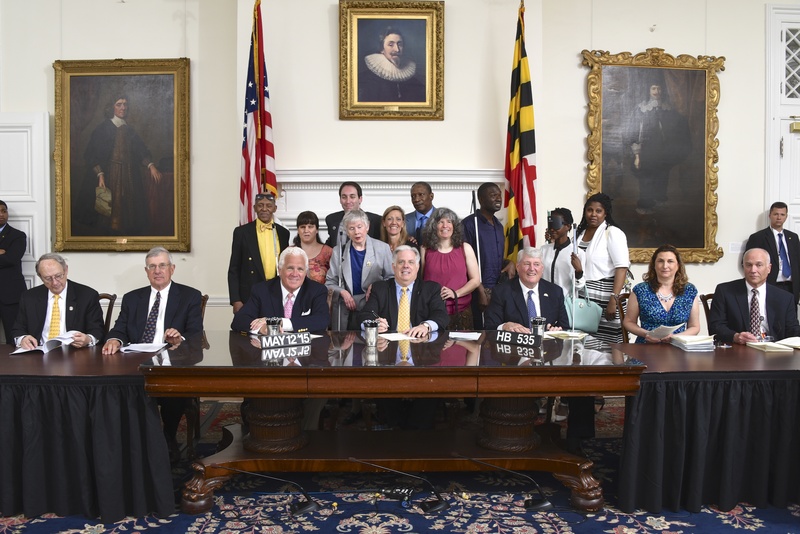 This legislation established a mechanism to pay for the review of accessibility of courses before approval by the Maryland State Department of Education. Read SB 461 in MS Word format or PDF format. HB 710 was enacted into law in 2006. This law contains provisions for the on-time delivery of accessible textbooks for blind and visually impaired students in elementary and secondary education. "Beginning on July 1, 2007, the Instructional Resources Center shall make reasonable efforts to provide the instructional materials in specialized formats to students who are blind or visually impaired for use on the first day of classes each year." This law implements the accessible textbook provisions of the 2004 IDEA. Read HB 710 in MS Word format. or Read HB 710 in PDF format. To read more about the implementation of this law go to COMAR (Code of Maryland Regulations) and read section .01 Textbooks and section .04 State Administration. In 2007, SB268/HB1056 was enacted into law. This law extends provisions for the on-time delivery of accessible textbooks to blind and visually impaired students in post-secondary education. Beginning with the term in September 2008, the Maryland State Library for the Blind and Physically Handicapped will receive electronic files from publishers and coordinate their delivery to students. Read SB 268 / HB 1056 Word format or in PDF format. Parents have the right to review assessments, reports and other educational documents five business days before an IEP is convened. Parents also have the right to receive a copy of the completed IEP five business days after the meeting. All documents must be provided in an accessible format. These rights are outlined in HB 269 and SB 540, which were enacted into law in 2010. Read HB 269 in Word format. Read HB 269 in PDF format. In 2015, HB535 was enacted into law. This legislation instructs local school systems to regularly notify parents of blind and visually impaired students with written and oral notice of the availability of these services. The law also creates an assumption that all blind and visually impaired students should receive these services unless the IEP team determines that they are inappropriate for the child. Students cannot be denied orientation and mobility services just because they have some vision. The law also describes the type of input and information that should be included in an orientation and mobility assessment. Read HB535 in MS Word Format or HB535 in PDF format. HB 592/SB 607 was enacted into law in 2000. It provides non-visual access to information technology and information technology services used in Maryland state government. Read HB 592 / SB 607 in Word format or in PDF format. To view the regulations that implement this law or the non-visual access standards created because of this law, visit the MD Department of Information Technology web site. The Rehabilitation Act is the Federal law that provides state vocational rehabilitation, supported employment, independent living, and client assistance programs. It also authorizes training and service grants administered by the Rehabilitation Services Administration. Federal law guarantees client involvement in every step of the rehabilitation process. Important choices you need to make include: choosing your employment or independent living goal, identifying the services you need, and deciding where you will go to receive those services. You and your counselor together develop an individualized plan for employment or IPE. You have the right to have a copy of the plan in the format of your choice. Your plan can be amended if you need additional services or your employment goal changes. Since no services can be purchased without a signed plan, the better you are prepared when you meet with your counselor, the faster your services can be provided. All assessments conducted by your rehabilitation agency are free. You may request that an interpreter be provided at all meetings with your counselor. You have the right to choose a person to accompany and assist you throughout the rehabilitation process. If at any point in the process, you do not agree with a decision made by the counselor, you may attempt to resolve your concerns with the counselor’s supervisor. You may also seek assistance from the client assistance program (CAP) and/or from any other advocate at any time in the rehabilitation process. You always have the right to file a formal appeal and to request formal mediation. Click here for more information on the Rehabilitation Act. The Maryland Department of Education, Division of Rehabilitation Services provides leadership and support in promoting the employment, economic self-sufficiency and independence of individuals with disabilities. The Office for Blindness & Vision Services publishes A Guide to Rehabilitation Services and Resources for Individuals who are Blind or Severely Visually Impaired. Click here for specific information on DORS policies and procedures or click here for information on the Client Assistance Program. In 2009, HB 689 / SB 613 was enacted into law. This law prohibits discrimination on the basis of disability against parents, guardians or caregivers who are involved in adoption, custody, or Children in Need of Assistance (CINA) cases. Read HB 689 / SB 613 in Word format or Read HB 689 / SB 613 PDF format. The law against discrimination on the basis of disability in custody, guardianship, and adoption was further strengthened in 2016 by the enactment into law of SB765/HB976. This law states that before reducing or changing the role of the disabled parent in their child’s life, the court must offer supportive parenting services to the disabled person. If a party in these cases alleges that the disabled parent is not capable of caring for the child, that party has the burden to prove their allegation. The judge in these cases must write his decision and the reasons for it in the record. For further information read SB765 / HB 976 in word or pdf format. In 2008, legislation was enacted to prohibit discrimination on the basis of genetic information in long-term care insurance. Read HB29 / SB18 in Word format or Read HB29 / SB18in PDF format. Legislation has also been enacted to prohibit discrimination on the basis of Blindness in life insurance. www.NFBMD.org does not provide legal consultation or legal advice. If you are in need of legal assistance please contact an attorney who specializes in disability law.